With Sleeping Beauty Castle, Fantasyland becomes the visual centerpoint for Disneyland and completes the transition from the real world. Each guest enters the park and shifts into the familiar of turn-of-the-century Main Street and with each step towards the castle moves closer to the fantastical and complete removal from the outside world. 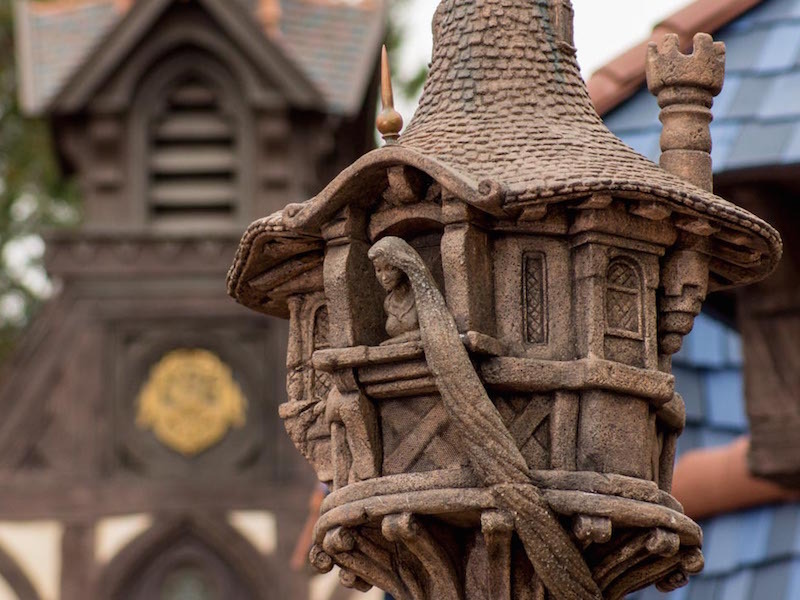 Fantasyland is not just the land of fairy tales, but of Disney fairy tales. Almost every attraction in Fantasyland has a connection to one of Disney's classic animated movies. These connections are most prominently made in the classic dark rides of Fantasyland. Ride through attractions were common features of amusement parks before Disneyland, but Walt Disney took them to the next level with fully created environments. Location: The north and northeast areas of the park. There are three ways in through Sleeping Beauty Castle and it can also be accessed from Frontierland, Tomorrowland and Mickey's Toontown. Alice in Wonderland Ride a caterpillar through scenes from Alice in Wonderland. Casey Jr. Circus Train Ride this miniature circus train through the miniature scenes of Storybook Land Canal Boats. Dumbo the Flying Elephant Fly around Fantasyland in a Dumbo vehicle. it's a small world Sing along with this classic ride as you float through representations of children from all around the world. King Arthur Carrousel Everybody gets to ride the white horse on this carousel. Mad Tea Party How fast can you spin in this scene from Alice in Wonderland? Matterhorn Bobsleds A roller coaster through and around a scale model of the Swiss mountain. Mr. Toad's Wild Ride Experience Toad's terrible driving skills in this classic dark ride. Peter Pan's Flight Float over scenes from the movie Peter Pan. Pinocchio's Daring Journey Travel with Pinocchio through his adventures on the road to becoming a real boy. Sleeping Beauty Castle Walkthrough Walk through the inner walkways of the castle while experience Sleeping Beauty's story. Snow White's Scary Adventure This dark ride travels through scenes from Disney's first animated feature film. Storybook Land Canal Boats Float through a miniature world populated by settings from Disney's animated films. Disney Princess Fantasy Faire Meet some of your favorite Disney princesses. Disney Tangled Meet Rapunzel and Flynn Rider from Disney's latest (as of November 24, 2010) animated feature. Pixie Hollow Meet Tinker Bell and her pixie friends. Sword in the Stone The magician Merlin needs to select a temporary king of Camelot from the audience. Troubadour Tavern Grab a sausage or snack in the back corner of Fantasyland. Village Haus Restaurant American grill food in a well-decorated "haus." Bibbidi Bobbidi Boutique A beauty salon for young children, providing princess makeovers. Enchanted Chamber Located inside of Sleeping Beauty Castle, a selection of princess merchandise. Fairytale Arts Get your face painted or your name painted in pictures. Fantasy Faire Gifts A small stand opposite "it's a small world" selling postcards, camera supplies, and other small souvenirs. Heraldry Shoppe Learn the history of your name and buy related souvenirs as well as replica knives and swords. it's a small world Toy Shoppe Toys of all types, with an emphasis on Pixar movie characters, princesses, and attraction models. Le Petit Chalet Gifts General small souvenirs. Mad Hatter Hats of all types; keep an eye on the mirror behind the cashier. Stromboli's Wagon Small souvenirs as well as some clothing and snack items. The Royal Wardrobe Princess apparel and costumes in conjunction with Disney Princess Fantasy Faire. Classic Disney Princess Storytelling See a fairy tale as told by one of the Disney princesses.